I have recently (a.k.a a few months ago) remodeled my Master Bedroom. Hopefully I will post the final room soon but until then I thought I would show you the art work I made to go above my bed. I was tired of the usual family pictures and really wanted something bold. So this is my CopyCAT Design. I found this picture online, I was originally looking at the chevron rug, but quickly fell in love with the Wall art. This room is so bold, but since yellow is not a color in my Master Bedroom I figured I would change it a bit and hoped to make it for way cheaper then this expensive look. The delemia I had was that my space needed something horizontal and not as vertical as this one. After debating over this for a week or so I finally decided to go for it. I chose to actually use 12" squares but use 6 instead of 4. 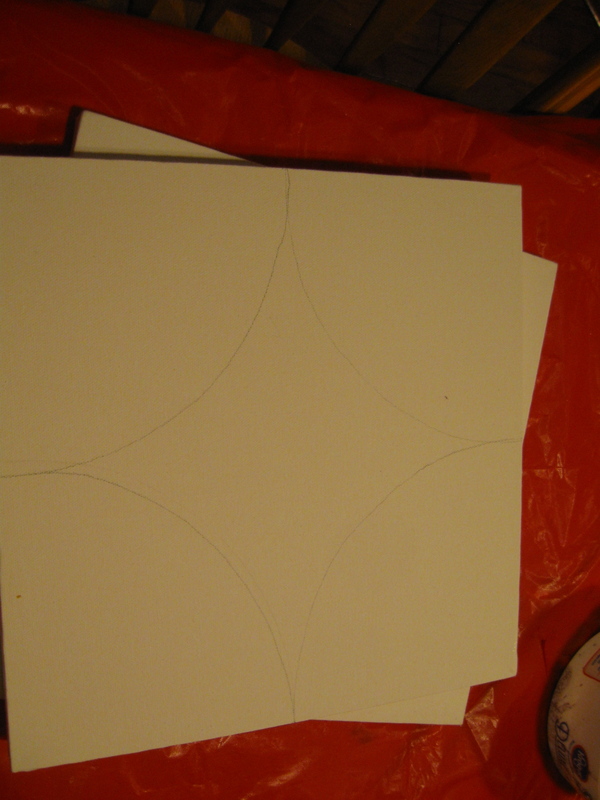 I bought a package of 3 canvases at JoANN's for $12 (after the 40% off coupon) for a total of $24! The package actually came with two 1" thick and one 2" thick canvases. At first, I thought I would only use four of them but I thought that adding the other 2 would give it the horizontal look that I was really wanting. 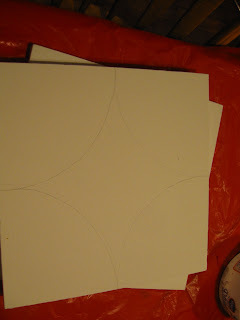 Drawing the Circles was actually pretty easy I just marked the center on each side. Then using a string tied to my pencil drew a curve from one side to the next and repeated on all corners. My master bedroom has a color scheme of gray and Turquoise. Since my bed is up against the one turquoise wall I wanted to bring the gray to that side of the room. I had some metallic silver craft paint that I used to paint the curves. Here is the finished piece on the wall. I love it! I do have to admit I was a bit worried as I was hanging it but you can't judge it until you hang it all. Now I love it. It actually made the room seem taller. The bed has always been the focal point of the room but now it really completes the look and brings it all together. I hung the two thicker canvases in the middle and the other 4 around. I think it came together perfectly.